Walmart has designs on expanding its business to include delivery service. 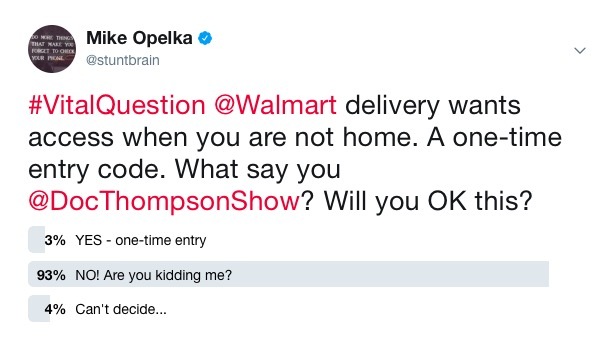 While retail delivery is not a new concept, the Arkansas-based retail giant is adding an interesting new amenity — delivery when you are not home. The Walmart plan is to offer next day delivery of purchases and allowing a Walmart employee to open a locked door using a one-time access code. Currently, the mega-retailer is testing the system which incorporates video monitoring technology and a keypad lock from August Home. Employees of Walmart are the beta testers for this idea. According to the retail giant, a nationwide roll out could happen in May of 2018. Cast your vote in this Twitter poll. Listen to Mike Opelka discuss the topic here.